In this house we eat hamburgers a lot. Not only because we love them, but also because since we went paleo they are one of the easiest things to cook up ahead of time and have on hand for a quick protein hit when hunger strikes or a post workout snack. Before I got married my hamburger patties resembled something more like awkward, lumpy ovals than anything close to the uniformly pressed patties you see in that picture above. I can’t even pretend to take credit for it – it was Kevin’s genius idea. Pretty sure that’s his military background taking control there. 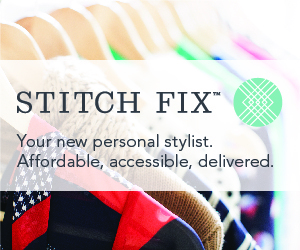 And so today I decided to share that idea with you! That’s right, YOU! Want to know the secret to these patties? Like I said, we like to buy a couple pounds of ground beef and cook up a whole bunch of burgers so we have easy grab and go foods on hand throughout the week. This past shopping trip we bought a family pack of 4 pounds of beef at $2.99 per pound…compared to buying the one pound packages, which were on sale for $4.99 each. Seriously? With the amount of meat we eat in this house, we’d go broke in a couple of weeks at that rate! 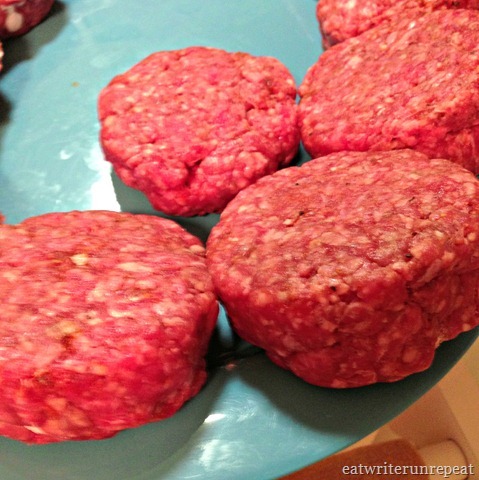 Our four pounds of ground beef made approximately 16 patties, which is perfect. Originally I had planned on posting step-by-step directions to the hamburger patty press process, but then I remembered I can take video on my phone and decided to do that instead. This is my first attempt with a video on the blog, so let’s hope it works! Enjoy! So basically, here’s the deal. Place a large piece of saran wrap over the can so that it hangs off on both ends. 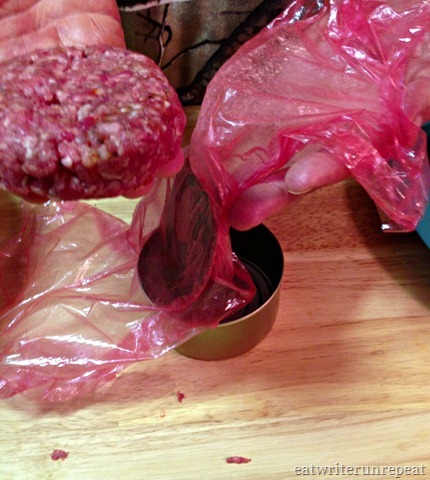 Using your hands, form a handful of hamburger into a ball and stick it in the can. 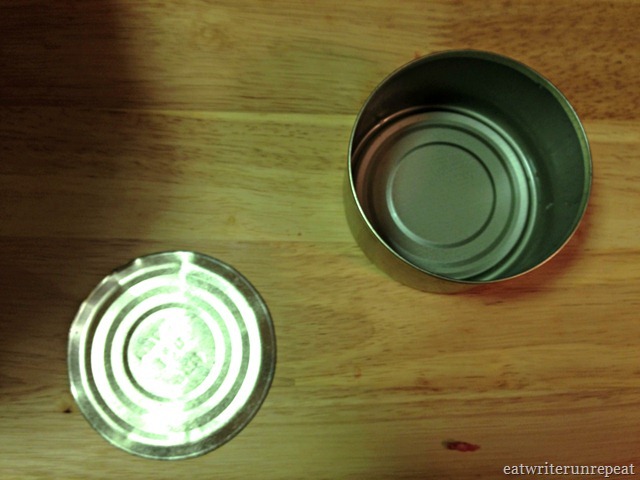 Cover with one of the ends of the saran wrap and put the lid back on the can. Being extremely careful with the lid, press down (with force), hard enough to pack the meat. Remove the lid and the saran wrap and pop out your perfectly formed hamburger patty! And there you have it! Piece of cake. 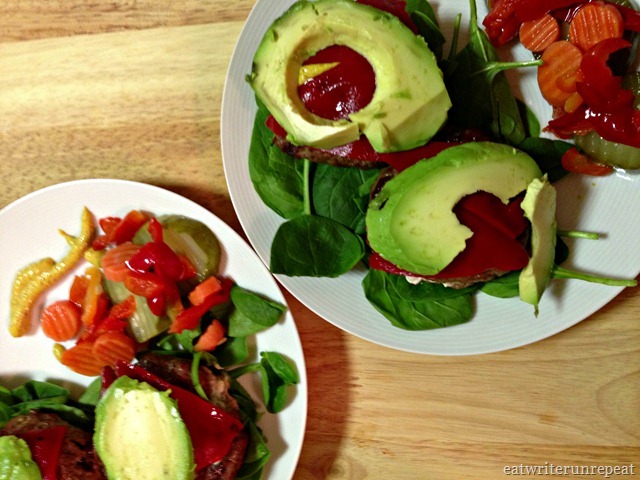 I served our first few hamburger patties on a bed of baby spinach and topped with spicy mustard, roasted red peppers, and avocado. Yum. 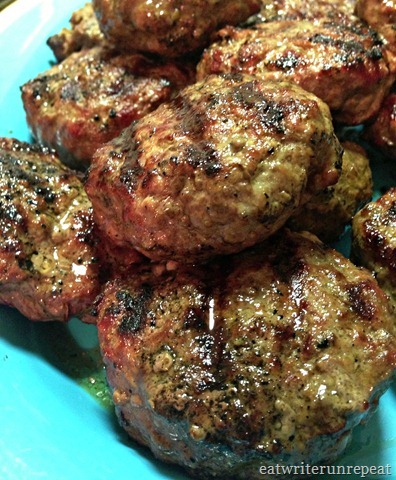 Posted on 24 October 2013 23 October 2013 by BeePosted in Beef, Dinner, Paleo, Snacks, Whole 30Tagged ground beef, hamburger patty, hamburgers, how-to, paleo, Whole 30. Looks great, thanks for the tips. I tend to form the patties by hand and then make a dimple in the middle so that they cook evenly. This method looks easy when making a bunch of patties at once! Hey! I recognize that blue plate! 🙂 You can keep it. You’ve given me so much, the least I can do is give you a plate! And you’ll probably use it more than I did!